From 2011, the number of designations of origin (Appellation d'Origin Contrôlée) in Alsace increased from three (AOC Alsace, AOC Alsace Grand Cru, AOC Crémant d'Alsace) to a full 53. It is a consequence of new EU rules for protected designations of origin, which for Alsace has meant that each of the area's 51 Grand Cru has become its own AOC. 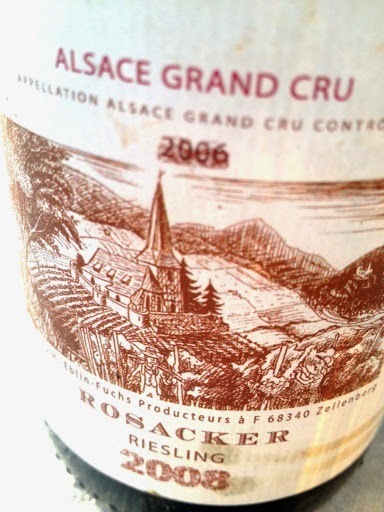 In the future, the label should state Appellation Grand Cru Rosacker etetera. Wacky, but perhaps good. 2008 Riesling Grand Cru Rosacker from Eblin-Fuchs Zellenberg is biodynamically grown. The color is golden yellow, and the scent is gerous and sweet with passion fruit, lemon, a whiff of diesel and almonds. The taste is initially closed, but soon spreads out comfortably in your mouth and provides intense fruitiness and a powerful, ripe acidity that creates a fine balance in the dry finish. Price: € 14.